The second of our opening league Derby matches takes place tomorrow. I expect this one to be quite different from the first. QPR were surprisingly poor last week and despite their less than satisfactory start to the season I'm sure the Rams will pose a bigger threat. Expectations are quite rightly high at the iPro and despite the absence of the excellent Will Hughes the Addicks can expect a tougher test. Manager, Paul Clement will be keen to turn things around asap and is to some extent under a bit of pressure even at this early stage of the season. Given our confident start it could be a good time to play them. The League Cup match against the Daggers gave more players game time with a few staking a claim for at least a place in the squad. Even Reza ( remember him ? ) managed to notch a goal, something only previously seen at Leeds whilst wearing a Charlton shirt. Despite that I'd be surprised if Luzon changed the team much save for Watt starting ahead of Karlan. 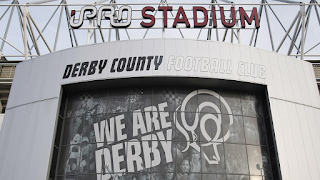 Following the visit to the Rams we're in the same neck of the woods on Tuesday for a very winnable game against Forest. You'd like to think that we could come away with at least 2 points from both games but this is Charlton so who knows ! I see that the folk connected with the appalling Channel 5 football highlights are suggesting that they are listening to feedback after their opening show. I've still no intention of watching. There are two simple ways to change that...........get a bloke called Manish to present it and put it on BBC1. There you are.......job done ! I shall be in God's chosen county tomorrow, Canterbury to be precise to hopefully cheer on the Kent boys to victory over a strong Lancashire team. Since Kent have been so poor in the red ball game this represents a chance to salvage something from the season. Good luck to all those travelling to Derby tomorrow. Have a good day and may we come away with 3 points.